A little bit of history on our home situation: she was built in 1989. Not exactly a banner year for home design (in my humble opinion). When we moved to Raleigh, I really wanted an older home with lots of character - think a 1930's Tudor or a Mid-Century Craftsman, but what we ended up with was a spacious and well-built late 80's home with a double porch on a cul-de-sac. We saw lots of potential not to mention this house checked off many of our must-haves. I was determined to interject some charm and character, paying tribute to those older styles I loved so much. The rules of the universe do specify staying true to a home's history but in our case, I have zero interest in embracing floor length ruffle-skirts or 80's brass! I know this is very obvious. But the right paint colors can modernize and lighten an otherwise outdated space. Our dining room used to be painted red. At the time, this was considered fashionable but it feels so heavy for today's standards. 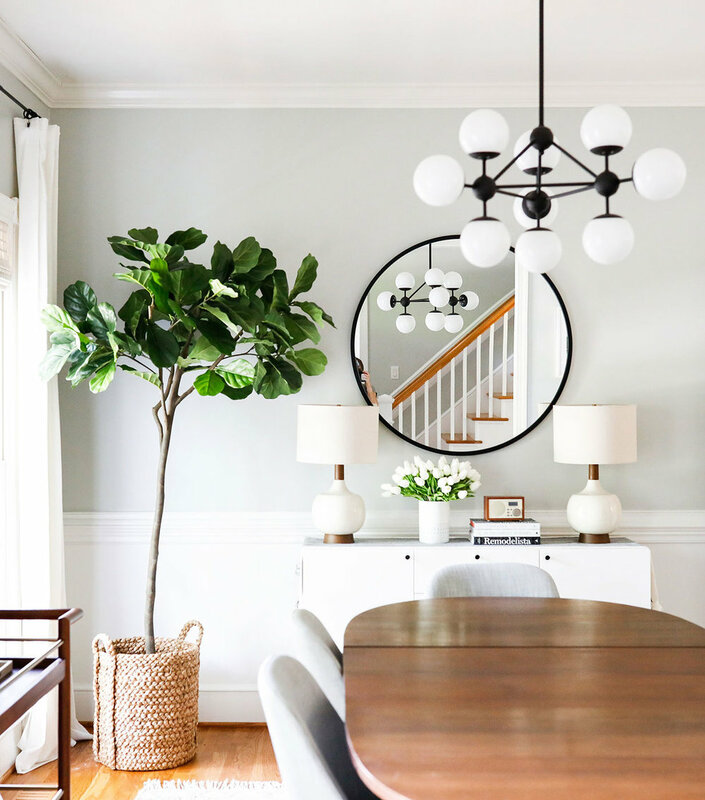 Choosing a light and bright neutral and continuing that color across multiple rooms or floors will keep things feeling cohesive and intentional, not to mention neutrals will stand the test of time. This is a big one for me. I happen to love many styles ranging from Scandinavian, Traditional, Modern, Coastal, Farmhouse and Mid-Century, but it's very important for my home to feel happy and full of character, no matter what style. Mixing styles is a great way to keep things feeling very collected and casual without committing to one style and making your 80's/90's home feel cookie cutter and personality-less. Home decor is fun and I don't like to take myself or my style too seriously. One thing to note is when mixing, make sure your color palette is somewhat consistent, which leads me to my next tip. As long as you keep things fairly consistent on the color wheel, you can go to town in the style department. My rule of thumb is to start with 1 or 2 colors that you respond to and love, add highlights and lowlights of those colors to the mix (this basically means a darker and lighter tone of one of your main colors), add in some neutrals and don't forget about texture! An interior color palette that is cohesive and flexible will create and stylish and more importantly - timeless look. 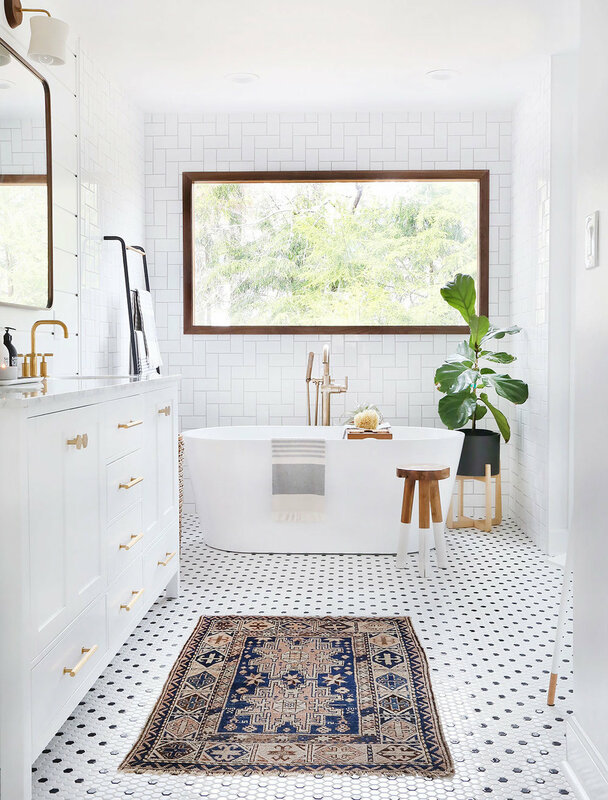 I will use my master bathroom as an example for this one. We renovated that bad boy last year and it was something I had been looking forward to for years! With all the buildup and excitement, I really wanted the space to be a showstopper. However, keeping things classic and as timeless as possible was equally as important. I chose materials like marble, white subway tile and hex tile in black & brass finishes as well as adding warmth with walnut accents. I want to love my choices and design decisions for years to come and choosing classic styles will achieve that effect. Another very obvious thing, but seeing is believing! I have added new lighting of all different styles to every corner of my home and it has immediately made an big impact. In the end, its really about what makes you happy in your own home! If you love it, go for it! Any additional thoughts on this subject? Tips? Tricks? Let me know in the comments!